I had one of those conversations you have that you reflect on later and think, “I never thought those people actually existed who believe that”. It just goes to show how ignorant I am! I was dumbfounded, this guy is an awesome guy, down to earth, fun to be with – but … woooo! Well we both put out our case strongly and went our separate ways in good relationship, but I continue to be alarmed! Of all the people in the world that should be at the forfront of environmental action and concern it should be God fearing bible believing Christ followers! Maybe you agree, maybe you don’t, but either way why not join a TEAR open forum and discussion panel on the 29th May. 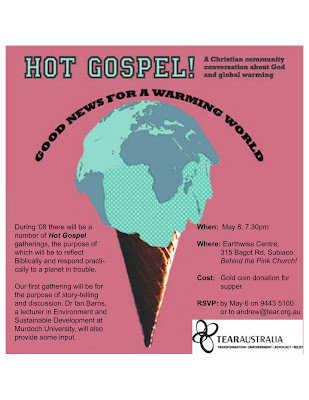 I am involved with a TEAR group that spends it’s time considering the Kingdom issues around global warming and creation care. 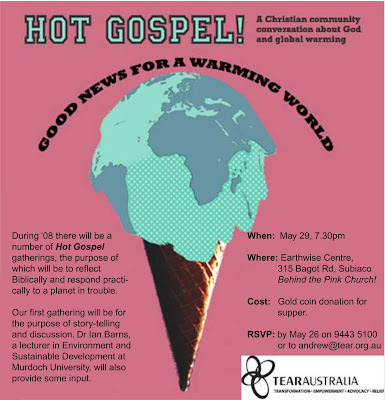 We desire to educate and inform believers of the importance of creation care and the ramification on our planet if something is not done at many levels (personal, community and political) about our warming planet.